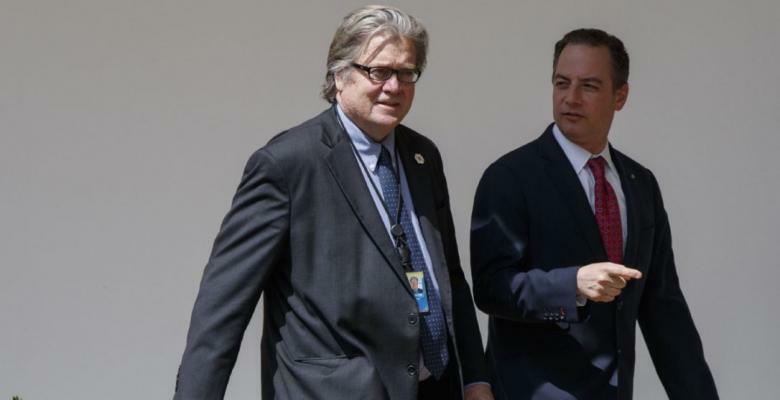 This past Wednesday, President Trump removed Steve Bannon from his unprecedented role on the National Security Council, sending the Washington punditry into a giddy fervor about what this might mean for his position in the White House. While it is undeniable that the move, from a PR standpoint at least, has distanced the white-supremacist in chief from the President, it remains to be seen whether this turn of events represents his ousting from the inner circle. While many theories have been espoused about his removal from the council, from conflicts with Jared Kushner who he reportedly called a “cuck,” to the machinations of Reince Priebus to regain control of the White House, I personally endorse the theory espoused by the (failing) New York Times. It seems quite in keeping with his past demeanor that the President was mostly preoccupied with Bannon’s appearance as the shadow President. From his depiction on Saturday Night Live to the now-iconic cover of Time Magazine, Bannon has become the shorthand for the President’s incompetence and inability to govern. There is no way that this perception sat well with an egomaniac of Trump’s standing. So, for those rejoicing at the symbolic value of Bannon’s removal, that this might signal some return to normalcy and procedure, I wouldn’t hold your collective breath. It seems far more likely that the move was simply a way of checking Bannon’s perceived authority in the public eye. We’re going to have to wait and see whether his influence is really diminished. And it’s difficult to overstate that influence. Bannon has been the primary architect of Trump’s policy on pretty much everything except healthcare reform since taking office. It was Bannon who spearheaded the hasty and shoddily constructed executive orders on immigration that were so hastily identified as xenophobic nonsense by the public and the courts. It was also Bannon who made deconstruction of the administrative state the official brand of the White House, a policy initiative that has now been softened and placed in the hands of Jared Kushner. Lest we forget it was the cantankerous rambling of Bannon which identified the media as the “opposition party” and created the climate of hostility between the executive branch and journalists that have placed this administration under more media scrutiny than any in history. Bannon’s scorched-earth policy in relation to the federal government has so far been the undoing of every action taken by the White House since January. However, this policy is also the one that endears him to the voter base which got Trump elected. Although those of us who think the nationalism and the populism have gone several bridges too far are delighted to see Bannon smacked down, this is probably not the case within Trump’s base. An unidentified staffer told Politico, "As we get further away from Inauguration Day, it is very obvious that no one cares what happens to the people who worked for the campaign or who have loyalty to the president. The swamp is winning the battle. And long time campaign staffers are proving to be the first casualties." The danger here is that the perception that the ‘swamp’ is overtaking their rebel-messiah could be disastrous for the Republicans in 2018, and bears keeping in mind when thinking about whether or not the President is going to keep Bannon around. He was, after all, the architect of the swell in populism that swept the election. His eerie influence is certainly not going to die quietly. Which brings me to a nagging thought that I haven’t been able to shake since this story broke. Bannon’s dismissal from the NSC might mean nothing at all. It may well be the obfuscating noise that has become the hallmark of the administration. When they are looking to distract, it can’t all be tweets about wiretapping. Sometimes the calculation has to be a little more deliberate, has to seem a little more serious, in order to have the intended effect. Don’t believe me? Here are the titles of some of the articles I have sourced in this piece: “Civil War Rages Through Trump Administration”; “The Knives Are Out for Steve Bannon.” While not all pieces had inflammatory titles, most focused on the inner politics of competing factions within the White House, speculatively pitting ideological fronts against each other to create the drama which sells papers. I was enjoying reading all these reports tremendously until I stumbled across an overview in The Independent, a British newspaper. Their removal from the immediacy of American politics allowed them to soberly assess all of this for what it is: palace politics. This firestorm around Bannon and the possible goals of factions in the White House, real or imagined, is the stuff of reality television. This is the new Kardashians. And while the influence wielders may have real effects on the world, speculating about their goals does nothing to arm us against the agendas of the powerful. Worrying about who has wronged whom, or who the President is closest to does little to inform the American people about the dumpster fire that is Washington of late. Where is the discussion of Bannon’s larger agenda of government disassembly? Of the White House’s declared aims of economic isolationism, wall building, and environmental disaster? It does not, apparently, sell as many papers as bland analyses of office politics. And while Bannon is bad, and his dismissal might be good news, vigilance, not the indulgence of wacky political in-fighting is the only way to be sure.